(Newser) – Paul Ryan reminded voters at a Pennsylvania steel plant today of President Obama's campaign-trail gaffes—from 2008. "Remember this other time when he said people want to cling to their guns and religion?" 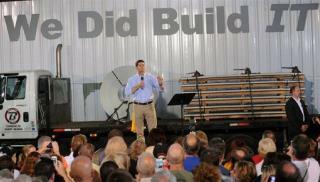 said Ryan, who has frequently brought up his Catholic faith on the campaign trail. "Hey, I'm a Catholic deer hunter, I'm happy to be clinging to my guns and religion." He went on to conjure other 2008 moments when Obama's "true" beliefs came to light, the Hill reports. On that note you can spend the rest of you natural life living in the 1950s say hi to Fonzie and Richie Cunningham for us, see ya don't wanna be ya!